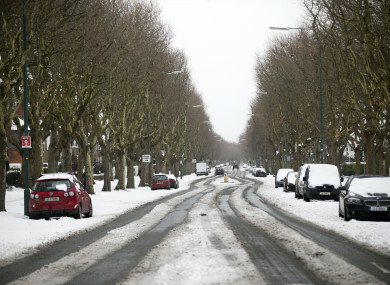 Snow on Griffith Avenue in Dublin in March 2018. MET ÉIREANN HAS issued a national Status Yellow snow-ice warning. The warning will be valid from 11pm tonight until 11am tomorrow. Icy and slippery conditions are expected due to accumulation of ice and snow on untreated surfaces. Scattered sleet and snow showers will be most frequent across Ulster and Connacht, but some showers will occur in central and eastern areas at times with the odd flurry further south. Accumulations of 1-2cm are expected. Wintry showers will become confined to northern areas by late evening, Met Éireann said. In terms of the overall forecast, outbreaks of rain already over the western half of the country will gradually extend eastwards to all areas during the course of the afternoon and evening. The rain will be heavy for a time and may be preceded by sleet over northern hills. Winds will be fresh to strong and gusty, south to southwest in direction, with gales along Atlantic coasts. Clearer, colder conditions with wintry showers will follow later in the evening. It’ll be cold, with highest temperatures ranging from four degrees Celsius in the north to eight degrees Celsius in the south. Lowest temperatures will range minus two to plus two degrees tonight. Email “Snow-ice warning issued by Met Éireann ”. Feedback on “Snow-ice warning issued by Met Éireann ”.